I remember reading somewhere on the blogosphere that this particular pastry has been ranked high on the list of the Most Difficult Recipes. Since then they have been on my mind, tucked away in a corner, but never forgotten. Then, a few days back, I came across Tracey's gorgeous blog listing her top 10 favorites from 2010. 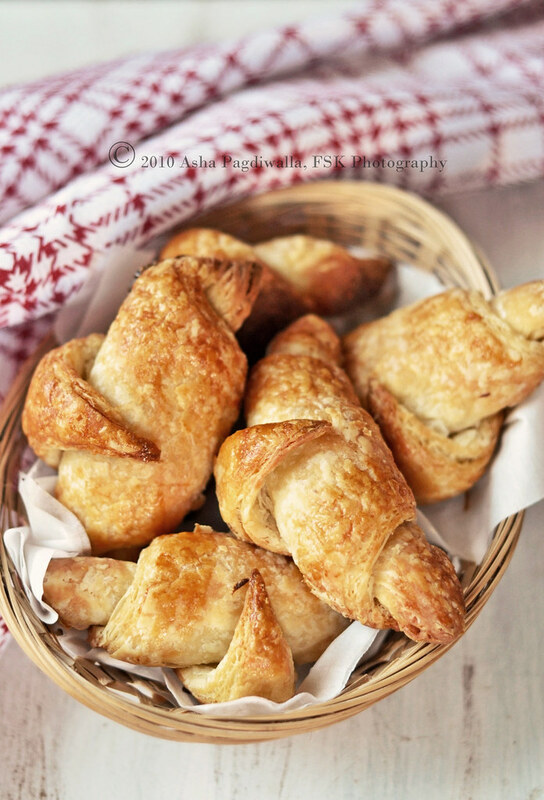 And, the pride and joy of the list was.... you guessed it, flaky Golden Croissants. I decided then and there that these beauties would be one of the first things I baked this year! 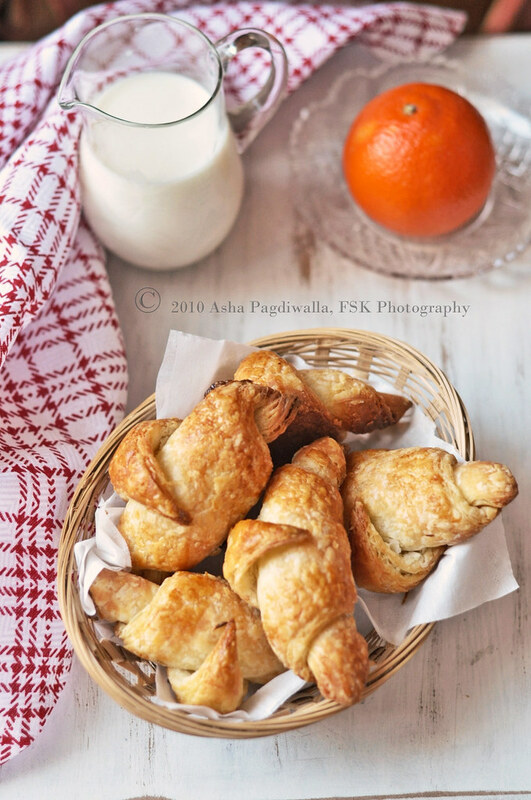 I had made puff pastry for my first Daring Bakers challenge, Vols-au-Vents, which, was a fun adventure in itself. The technique to make the croissant dough is pretty similar, actually. So, I was rather comfortable with it. The layers of flakiness in a perfect croissant (as also puff pastry) comes from the even distribution of the butter into the dough. The method to do that is to tuck a flattened slab of butter into the rolled out dough, fold like a business letter and re-roll. Then, you repeat the process over about 4 more times. The trick here is ofcourse make sure that the butter stays cold throughout the process and if ever, you find the warm sun streaming in or an overenthusiastic heater cramping your style, pop the dough into the refrigerator for 30 minutes to an hour to allow the butter to harden up sufficiently but still remain pliable. 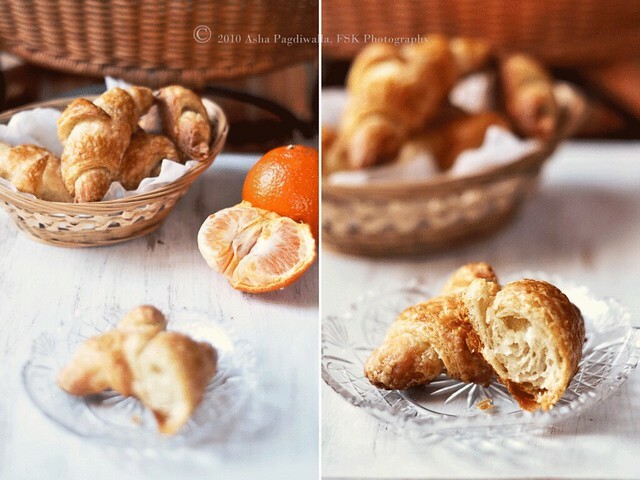 Now, a good question to ask is, if the technique is really the same, what is the difference between the croissant dough and puff pastry? Can one not interchange the two? The only difference I noticed is that the croissant dough has yeast in it. But, unlike typical bread dough, you don't see a significant rise in volume before the dough goes into the oven. I don't know how the chemistry works, and if someone can explain, I am all ears, but the amount of yeast is really low and even while proofing the rise is just barely there. But, once the shaped dough hits the oven, it rises beautifully creating height and a lot more airiness during the baking process. 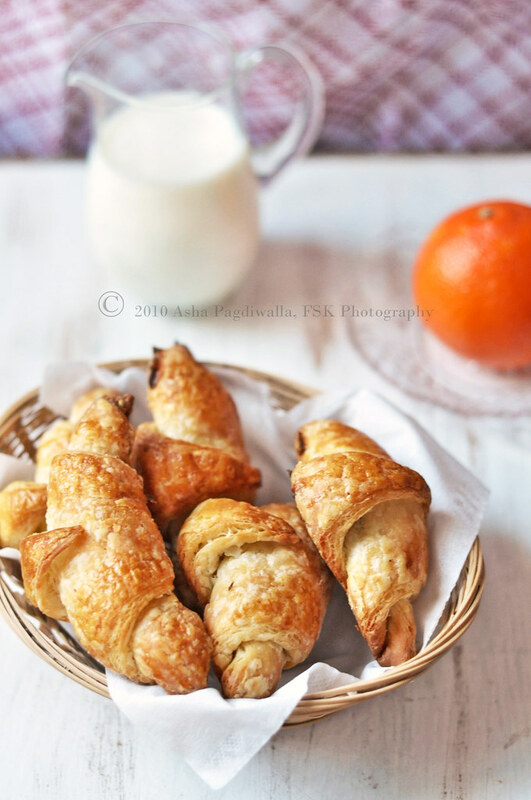 I also think that the yeast contributes to the softer and cake-ier texture of croissants compared to the crunchier puff pastry.